Looking for the perfect detox family meal after indulging a bit heavily over the holidays? Our preferred way of detoxing is not by starving ourselves, but by eating food that is super fresh, home-made and unprocessed. 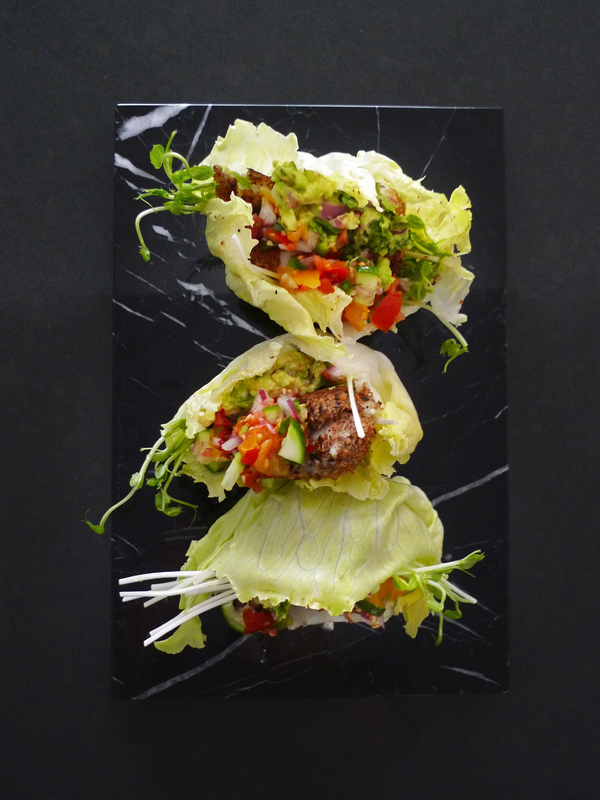 The Lettuce Cup Taco is our family’s favourite ‘post indulgent’ meal. I have wanted to share this PKU-family friendly dish for a long time now. 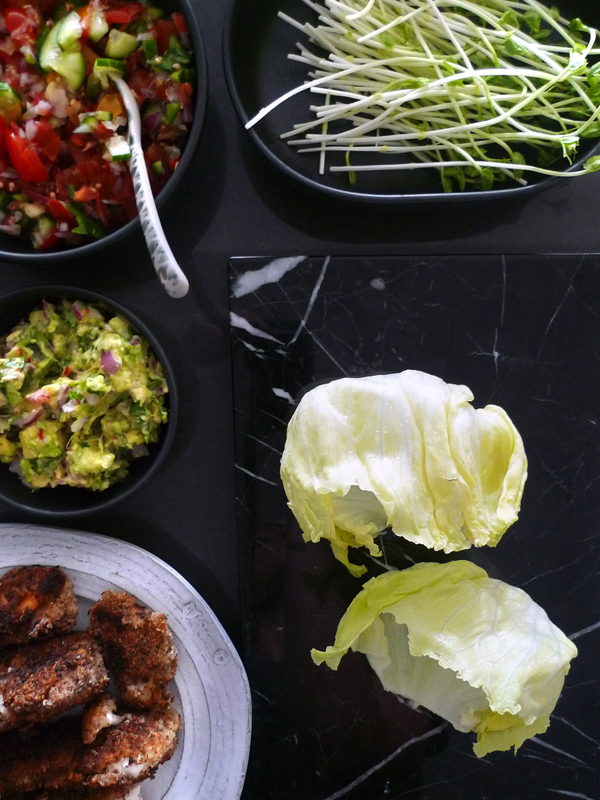 In fact, I finally got a bit organized and am sharing with you 3 separate interpretations: Vegetarian (made with Portobello mushrooms), Fish and Fruit tacos; all assembled in a fresh lettuce leaf. It is our favourite and most often prepared family meal, and we especially love to share with others. Whether it be for a relaxed dinner party or as a simple detox meal after the holiday celebration; it is often made during the warm summer months when the ingredients are fresh and seasonal. Paired with our home-made tomato salsa and guacamole, these tacos are packed nutritionally-dense fruit and vegetables. 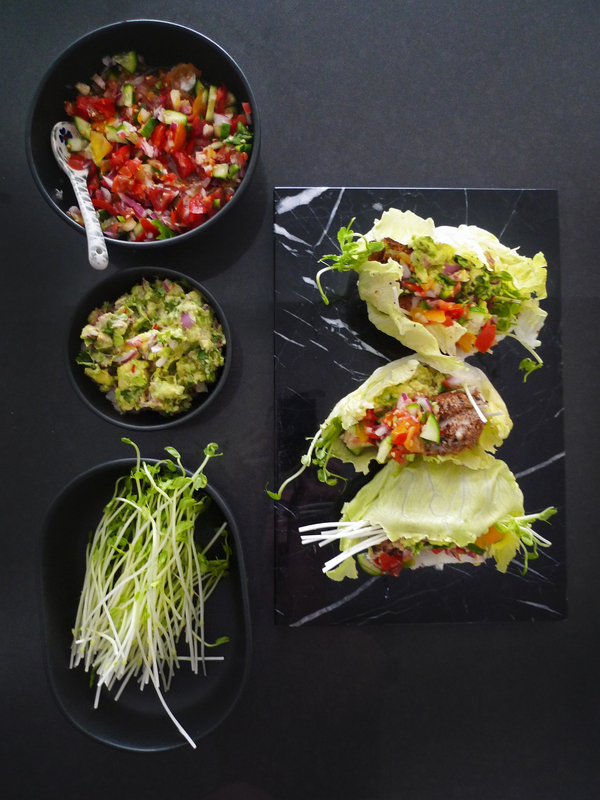 This popular Lettuce Cup Taco is seasonal, light, simple and highly adaptable to any food intolerance or restricted diet (such as PKU). It is gluten and lactose free and can easily be made for vegetarian or vegan diets. Best of all, you can make it to be shared, so everyone at the table can assemble the taco as they wish; perfect for large groups or picky eaters. I also do not wish for anyone to feel left out or different due to their dietary restrictions. In this way, I can accommodate for all. Another element of this dish that I love is the generous use of lemons and limes. 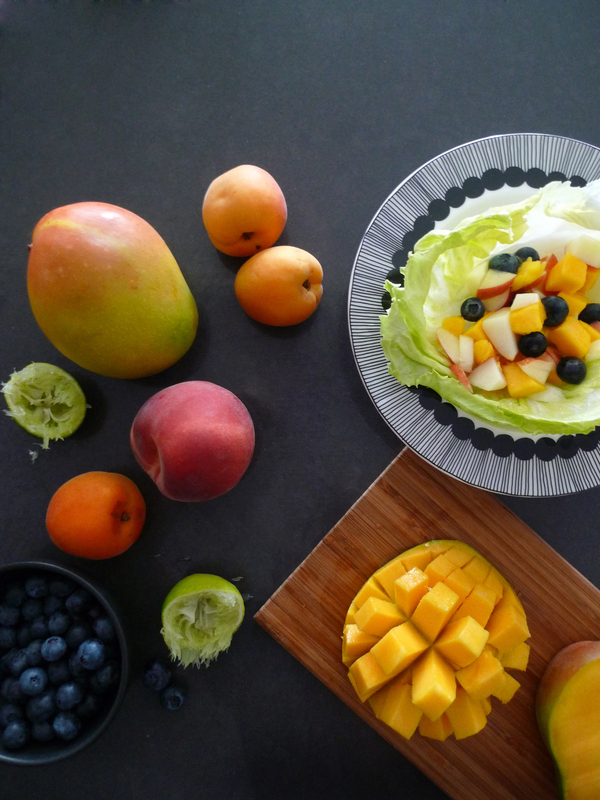 The citric acid found in the fruit aids in the absorption of iron found in protein; great news for those of us who suffer from IBS or sensitive bellies. To make the dish more FODMAP-friendly, I have eliminated any corn. To make it even more suitable for a FODMAP diet, you can omit the garlic and onions. There are countless ways to mix up things up and substitute ingredients. The recipes listed below are just a few examples. 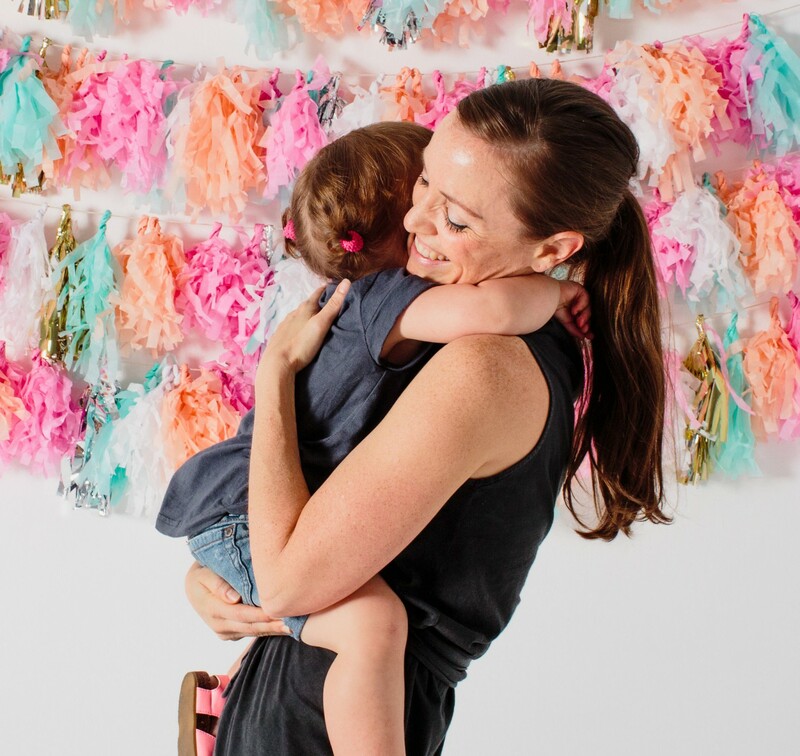 Every time we make it, we change it up depending on what is available or what gems we find. I hope you love this meal as much as we do and hopefully you find a way to make it your own. Begin by creating 3 separate stations for coating the main; first, place the flour for dusting on a plate or flat surface / second, mix the egg in a bowl large enough to place the main / third, combine the psyllium husk (or LSA), coconut and salt on a plate or flat surface to fully coat the main. Mushrooms: Slice the mushrooms into 1/2” thick or 8 even portions per mushroom. Dust lightly with tapioca flour mixture, dip the slices into the egg mixture and coat with the psyllium husk mixture until evenly coated. Fish: Follow the sample procedure as the mushrooms. Cut the fillets into approximately 100mm long pieces or 10 even portions. Dust lightly with tapioca flour mixture, dip the slices into the egg mixture and coat with the LSA mixture until evenly coated. Heat the coconut oil to 160 degree C / 325 F / medium Gas in a large saucepan. To test the temperature, sprinkle flour into the oil. It should float and sizzle; not burn. Working in batches, fry the mushroom or fish until cooked through and the coating turn a golden brown. Drain on paper towels. 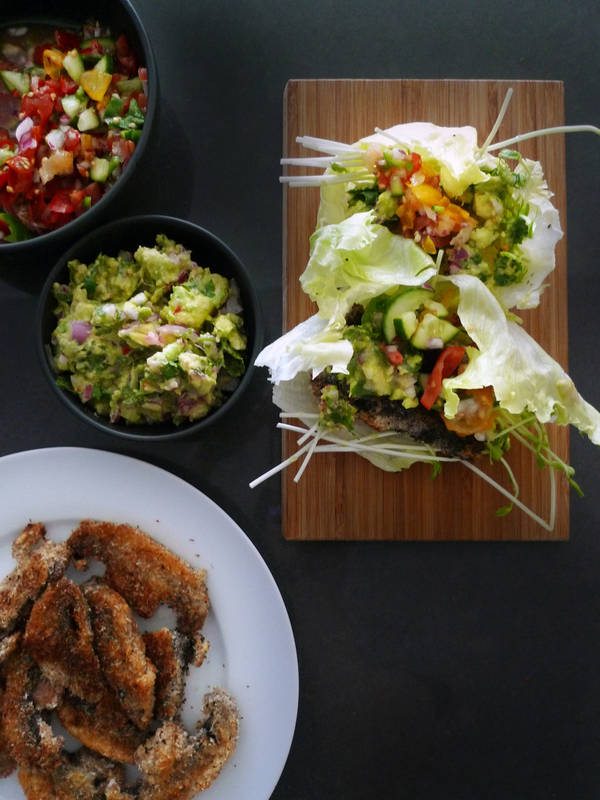 Place the lettuce leaves, guacamole, salsa, sprouts, fish, mushrooms, fruit and lemon/lime wedges on a serving platter to share. To assemble the lettuce cup tacos, hold the cup in 1 hand and fill each with any or all ingredients. Assemble the lettuce cup tacos as per procedure above. – The size of the portobello mushroom will impact the overall protein count. Please measure the weight of the mushrooms to accurately determine the protein if you are cooking for a PKU diet. – There is an egg mixture in the Vegan Taco that acts as a binder to ensure the coating stays on the mushroom. After I cooked all the mushroom slices, I did not end up using the entire mixture (only half); therefore, you will need to estimate or calculate how much of the mixture you have used. If you wish to reduce the overall protein content, you can add more water to the mixture and it should still stick with the coating. – The amount of coating mixture (psyllium husk and coconut) is dependent on the size of the mushrooms and how generously you wish to coat. Therefore; adjust the final protein count after you finish coating. – If additional protein is required, LSA can be added to the coating mix; adjust according to your needs. 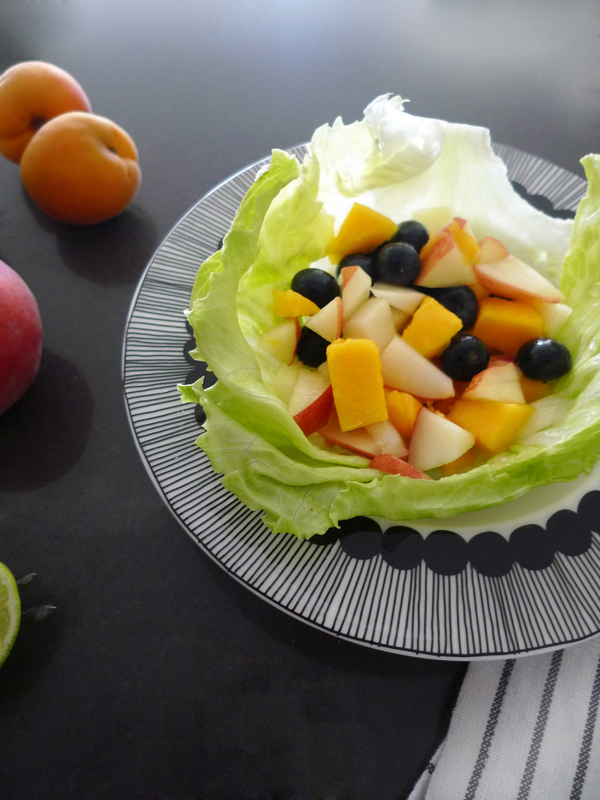 – Other salad leaves can also be used in place of Iceberg. For instance we have also used cabbage or Tuscan kale leaves (lightly steamed to be softened), radicchio or endive. – For the fruit tacos, grilling the fruit gives them a lovely smokey taste. The fruit best used on grille are pineapple and peaches. Slice the pineapples into rings and cut the peaches in half before grilling. Cut into bite-sized sections before serving and assembling into the taco. This looks wonderful, thanks for the inspiration!